Every year PNNAG donates fabric tote bags and gift sacks filled with mostly handmade gifts to the Cancer Care Alliance units of the University of Washington Medical Center. ​It is the intention that these various items then be given as gifts to family, friends and clinical staff or kept as a gift. A gift blesses the giver as well as the recipient. The Gift Gang distributed 134 bags filled with handmade items in December 2018. Our goal for 2019 is 120 bags. We will stick with this goal while improving our organization and contents. We are always working on creating gifts to fill the bags. Any hand-crafted item that you might give to a friend or relative would make a lovely gift for a cancer patient to give to a friend or relative if they only had the time and energy. Sno-King Satellite hosts the bag stuffing event on the second Monday of December. Distribution takes place the following day. 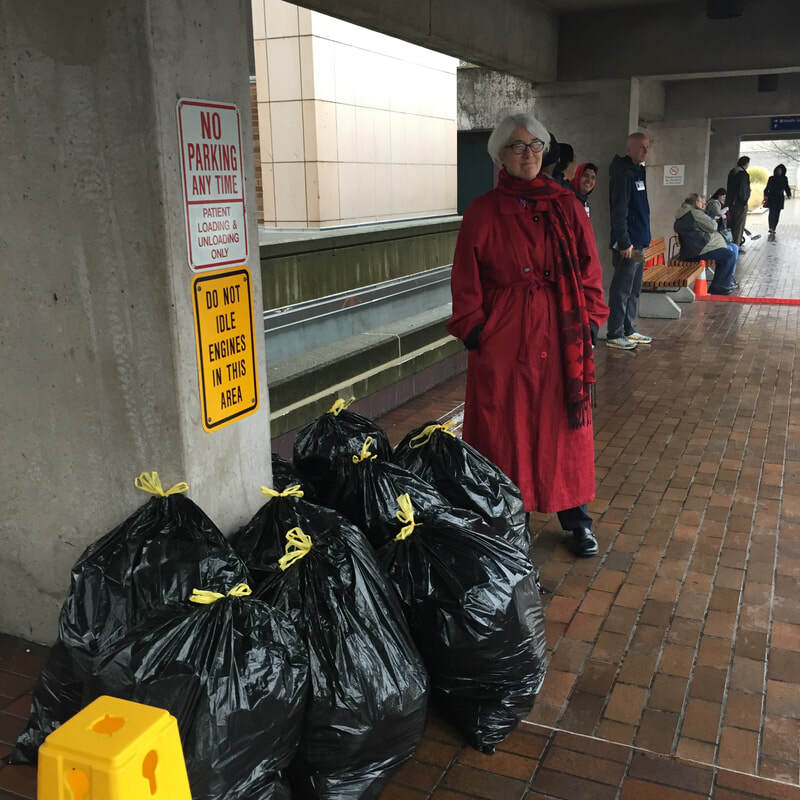 Carol Wiesenbach with 134 gift bags cleverly disguised as trash, waiting in the valet parking zone for the carts to transport the gifts inside for the annual distribution of Gift Gang gift bags December 2018.